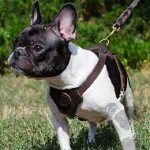 How to Train Bulldog Puppy to Wear a Collar? 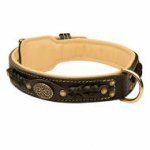 As you know, many Bulldog owners face the problem of how to train dog to wear collar. 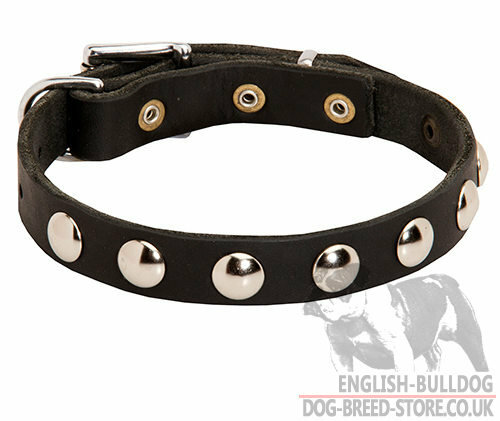 As soon as all the vaccination is done, it is high time to go for a walk with your Bulldog puppy and its training to wear a collar. 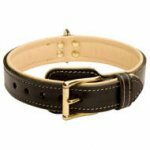 What collar to choose for Bulldog puppy? 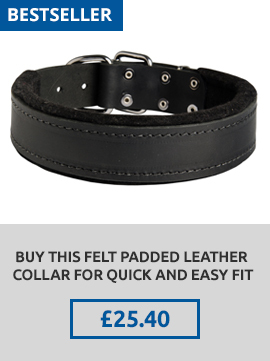 Its first collar shouldn't be richly decorated, wide, heavy and massive. It is better to choose narrow and light-weighted collar of natural leather. This material is safe and dog-friendly. Bulldog puppy training to wear the collar should be careful and staged. 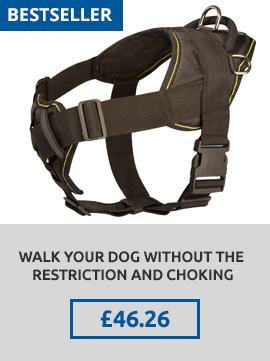 The puppy should feel comfortable with the collar. Put the collar on the puppy for a while when you are at home. 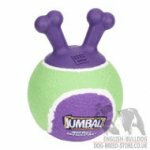 Distract it with game, stroking and treats if the puppy tries to take the collar off. 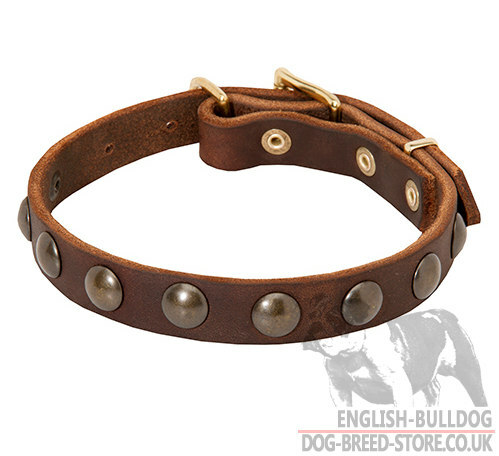 Then train your Bulldog puppy to wear the collar every time you go out. 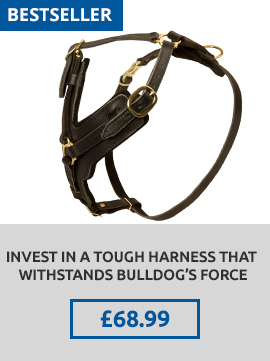 But it is better to take the collar off when your Bulldog is at home to avoid any discomfort and problems with breathing. It should be also mentioned that Bulldogs are walked before feeding. Watch your puppy not to be tired during walking. Avoid long walks as your Bully doesn't like them. 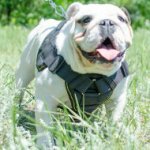 If you want your Bulldog to wear the collar with pleasure, follow the tips mentioned above and choose specialized collars for puppies in our online dog store, which are handcrafted by professionals! You have an opportunity to buy our products on 18-19th of January, 2018 with FREE SHIPPING. 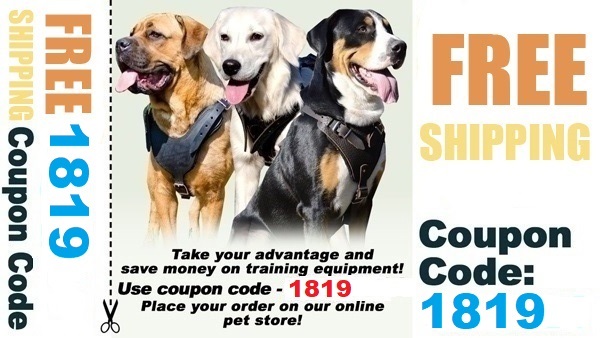 Coupon code is 1819. 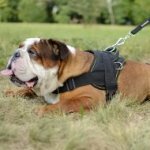 Feel free to place your order on our website www.english-bulldog-dog-breed-store.co.uk! Don't forget to put your coupon code in the coupon field. Note: the discount is applied for registered mail only. If you wish to get your parcel by express shipping (EMS) you will have to pay the price difference of EMS and registered. The discount is not applied to products heavier than 2 kg.